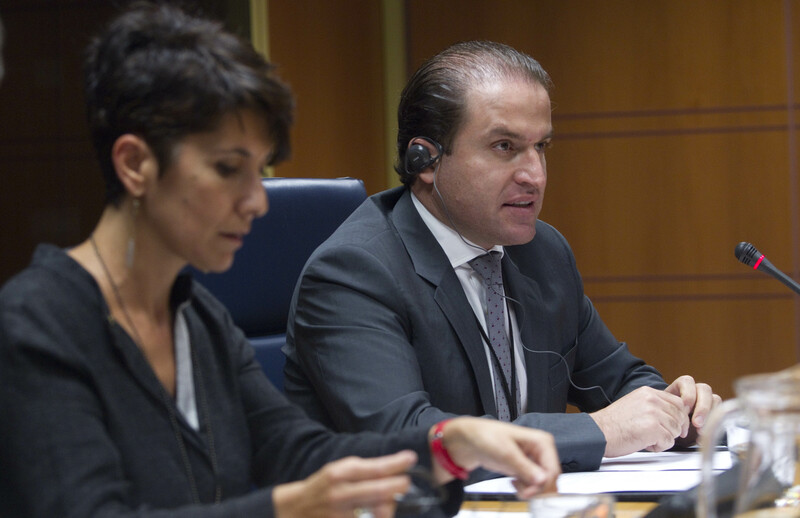 This week in the Basque Parliament, the Kurdistan Regional Government Representative to Spain Daban Shadala, stood before the Commission of Human Rights, Equality & Public Participation of the Basque Parliament to put forward the needs for assistance from the Basque Regional Government with the ongoing humanitarian disaster facing the Kurdistan Region. This follows a recent motion that was passed in the Basque Parliament which specifically highlighted that the Basque Regional Government must respond to calls from the KRG for humanitarian aid and assistance. The President of the commission, Maribel Vaquero Montero, opened the way for Daban Shadala to deliver his presentation on ISIS, its growth, organisation, funding and the ensuing humanitarian disaster facing the people of the region. Daban Shadala informed members of the commission of what the KRG needed in order to continue to support the large numbers of refugees and IDPs in the Kurdistan Region, and what those people specifically needed. The commission was told that “humanitarian aid and assistance from the Basque Regional Government to the Kurdistan Region is essential in order to provide the affected people with their basic needs and to relieve some of the pressure off the KRG” which has not received its budget share from the Federal Government of Iraq since March. He went on to state that “we are struggling in our efforts, as we lack the resources and financial capability to deal with over 1.8 million refugees and IDPs.” The KRG is currently working very hard to ensure that the affected people are receiving the essentials and “the assistance from the Basque Government would improve the situation greatly”, he went on to say. The KRG Representative also highlighted the human rights abuses that ISIS are committing in the territory which they control targeted especially against non-Muslim minorities. The commission is made up of five parliamentary groups which include: EA-NV (Basque Nationalists), EH Bildu, SV-ES (Basque Socialists), PP-ETP (Basque Poplar Group), and Mixto-UPyD. All parties expressed their solidarity with the Kurdish people of both the Kurdistan Region of Iraq and Rojava, expressing their gratitude to those Peshmergas who are defending the world from the barbarity of ISIS. They also strongly condemned the terrorist group and the atrocities it has committed. The KRG Spain Office will now begin coordinating the technical details with the Basque Regional Government for the delivery of the aid to Kurdistan. The Spanish government has already sent €500,000 worth of humanitarian aid to the Kurdistan Region to help ease the situation and provide the essentials to the affected people. On Monday the University of Santiago de Compostela in Galicia, Spain, held an opening event for the Erasmus Mundus “Marhaba” Project which it will be coordinating. The project has been sponsored by the European Commission with a total of €2,394,050 of funding having been allocated to see the project through. The aim of “Marhaba” is to develop collaboration between university students and staff of the European Union and Iraq/Iran. It has been designed to enhance the capacity, transparency and employability as well as skills and qualifications of academic institutions and individuals. The project includes countries participating from eighteen universities, four from Iraq, five from Iran and nine from the European Union (Spain, Germany, France, Poland, Italy, UK, Bulgaria and Poland). The project will last until the 14th of July 2018 and scholarships will be awarded over this period to applicants that have been selected by their respective institutions. The program is designed to finance the expenses of the students and academics that have been selected, including: travel costs, visa costs, subsistence costs, participation costs and insurance costs. The universities that successfully applied to partake in the program from the Kurdistan Region of Iraq were: Halabja University, Koya University, Slemani University and Raparin University. Their application process and their partaking in the project has been, and will continue to be, supported by the office of the Kurdistan Regional Government Representation in Spain. An overall of 41 places have been allocated to students and academics of the four Kurdish universities. The places have been allocated as follows: 15 Undergraduate, 7 Masters, 8 Doctorates, 2 Post-doctorates, and 9 Staff. The opening ceremony held yesterday was attended by representatives from all our Kurdish Universities, as well as the Kurdistan Regional Government Representative to Spain, Daban Shadala. It began with a welcoming speech delivered by the vice rector for the Internationalisation of the University of Santiago de Compostela, Professor Carlos Salgado. He thanked those who were involved in making the project happen and the European Commission for its funding. The KRG Representative to Spain Daban Shadala then thanked the University for its role in the project and gave a brief insight into the state of higher education in the region, stating that it “had been neglected during the regime of Saddam Hussein, but since his overthrow in 2003, the standards of higher education have been improving dramatically.” He praised the “Marhaba” initiative as a project that could “enhance the academic experience and growth of all participants.” The Project Office from the European Commission, Karolina Garbaliauskaite, also gave her thanks for all those who had participated in making the project possible, and to the University of Santiago de Compostela for coordinating and managing the project. The representatives of the Kurdish Universities were then given the opportunity to present their respective institutions to the guests. Following the University presentations a general overview of the “Marhaba” project was given, this included highlighting the role of the University of Santiago de Compostela as the coordinator and the role of the partner universities. The next day there was a workshop given to the representatives of the universities which gave a technical breakdown of the project including its management and quality control aspects. The inauguration of this project is a sign of the development that the Kurdistan Region of Iraq is going through in order to further advance its educational standards to meet those of various European institutions. Salahaddin, Kurdistan Region of Iraq (KRP.org) – Kurdistan Region President Masoud Barzani welcomed UK Foreign Secretary Philip Hammond on Monday. In a meeting in the President’s office in Salahaddin, the President and the UK Foreign Secretary discussed the fight against ISIS terrorists, recent advances by the Peshmerga forces, and the political process in Baghdad. President Barzani thanked the UK and other coalition countries for their support to the Peshmerga forces and noted the recent gains by the Peshmerga forces against the terrorists. Foreign Secretary Hammond commended the role of Kurdistan and the Peshmerga forces in the fight against the ISIS terrorists and recognized that the Kurdistan Region bears the lion’s share of this fight. Both agreed that to defeat ISIS terrorists, in addition to joint military, political, and economic effort, there is also a need to confront their twisted ideology. On the political process in Iraq, President Barzani stated that the Kurds have decided to support the new Iraqi prime minister. The Dutch Minister for Foreign Trade and Development Cooperation, Ms Lilianne Ploumen, visited Erbil yesterday to discuss the latest security and humanitarian developments with Kurdish leadership. The Minister and her delegation met with Minister Falah Mustafa, Head of the KRG Department of Foreign Relations, Dr Fuad Hussein, Chief of Staff to Kurdistan Region President Masoud Barzani, and Erbil Governor Nawzad Hadi. Minister Ploumen lauded the extraordinary role of the Kurdistan Region’s people and government in not only fighting the terrorists but also providing shelter for hundreds of thousands of displaced people, especially members of ethnic and religious minorities. She stated that the efforts to alleviate the suffering of IDPs and refugees are very admirable. The Minister welcomed the formation of an international coalition in the fight against ISIS terrorists, adding that the Netherlands is willing to support and participate in the coalition forces’ battle against the terrorists. On behalf of the KRG, Minister Mustafa noted his appreciation for the support of the Dutch Government and briefed Minister Ploumen on the latest humanitarian and security developments. He stated that the KRG has made a concerted effort to care for refugees and the displaced, but further support from the international community is urgently required, as the needs of these civilians are beyond the KRG’s capacity. Minister Mustafa also briefed Minister Ploumen on the latest military advances of the Peshmerga forces. He reiterated the commitment of the Peshmerga forces to fight the terrorists, calling for further military assistance from the international community in order to continue degrading the terrorist organisation and win battles on the ground. Finally, Minister Mustafa called for the support of the Netherlands as the KRG seeks international recognition of crimes committed against religious and ethnic minorities by the terrorists as acts of genocide. A German delegation, headed by Federal Minister for Economic Cooperation and Development Gerd Muller, arrived in Erbil yesterday to discuss the latest developments in the Kurdistan Region. The delegation met with Minister Falah Mustafa, Head of the KRG Department of Foreign Relations, Governor of Erbil Nawzad Hadi, the KRG Representative to Germany Dilshad Barzani and other senior officials. Minister Mustafa thanked the delegation for visiting Kurdistan at such an important time, noting the KRG’s sincere appreciation for the humanitarian and military support provided by Germany. The Minister said that throughout history the Kurdish Peshmerga forces have proven their courage and resilience. They are currently risking their lives as they beat back the terrorists in order to protect all civilians in Kurdistan, including the many ethnic and religious minorities now sheltered in the Kurdistan Region. Minister Mustafa called for Germany’s moral, legal, and political support as the KRG seeks international recognition of terrorist crimes committed against religious and ethnic minorities as acts of genocide. Minister Muller also informed Minister Mustafa that the German government has increased its humanitarian assistance for IDPs and refugees sheltered in Kurdistan by €25 million and reiterated that the German Government will continue to provide such humanitarian aid. The Deputy Head of the KRG Department of Foreign Relations Karwan Jamal, Germany’s Acting Consul General Oliver Schnakenberg, and senior officials from both sides attended the meeting.